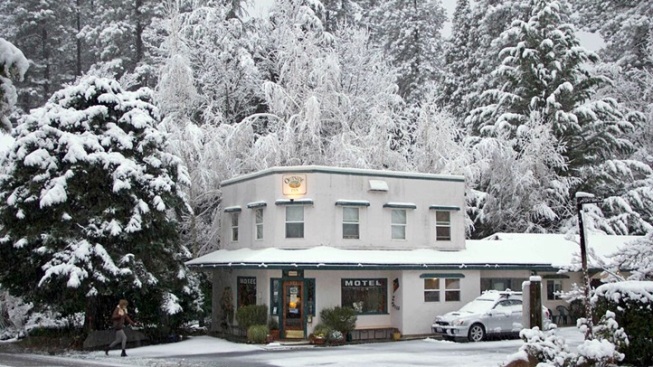 A Nevada City motel keeps a frosty theme lively in a cozy room. Love a sweet theme room that reflects the seasons? Nevada City's Outside Inn motel has 'em. CALIFORNIA IS RIGHTLY FAMOUS... for just about everything one can be famous for, including, of course, being famous. Given our propensity for standing out, and tooting our own horn, and letting our freak flag fly, and shining our own sun, it shouldn't surprise that several of our stay-over spots lean to the surreal. You can sleep in castle-like hotels, and desert-rustic casas, and San Luis Obispo's own Madonna Inn is the ultimate player in fantastical guest room theming. But finding a spot that does an inside/outside thing, in terms of a room's look, is still a bit of a sticky wicket. Unless, of course, you happen to be in Nevada City, at the Outside Inn, an old-school motor court-y property where each room is gently designed to reflect a different prism of nature, science, or life. (Think Celestial, Wildflower, Rock Climbing.) The notions of summer and springtime find a lot of play at the Outside Inn, via rooms themed to fishing and paddling and, yes, flowers. But autumn and winter get their own rooms, and if you're lucky enough to time your visit right, to either the changing foliage or a solid snowstorm, then you'll have the full seasonal experience via interior decor and the beauty of the snow, or leaves, once you step outside your room. THE WINTER ROOM... includes a pair of vintage-sweet skis above the bed, and poles, to put you in the right frame of schussing, if you happen to be stopping on your way to Boreal or the Tahoe resorts. Some wall photography depicts a "Sierra winter landscape," the better to remind you just where you are, and what's a short drive away (Truckee, Donner Pass, Squaw Peak, and so on). And a cozy kitchenette is where you make your cocoa or other toasty winter sips. Will it be wintry inside your room, temp-wise? Nah, there's heat. Will you be a bit chillsome if you leave the Outside Inn and stroll over the Victorian Christmas, Nevada City's December street fair? You probably will, so bundle up (and take note that Victorian Christmas happens on select days and nights during the month). Can you even wait for spring, if you love warmer weather? You could stay in one of the summery rooms at the motel, even if it is snowing outside. Is that too discombobulating? Not really, when you adore visiting the Golden State's many themed hotel and motel rooms. A little character goes a long way, even if you're staying in a wildflowery space as the chill wind blows at the window.